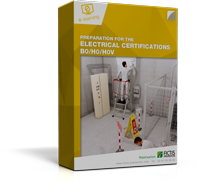 E-learning "Electrical certifications - B0 / H0 / H0V"
Electrical auhorizations for non-electrical work: worker and foreman. Preparing the B0/H0/H0V certifications in compliance with the NF C 18-510 French norm, approved on December 21, 2011. Safely carrying out non-electrical works. Average duration of the training: 4h 30m maximum depending on the usage and the learner’s profile. Refresher mode: placement tests enable the learners to automatically provide the appropriate training based on their knowledge. The refresher duration varies depending on the learners’ profiles.